Skibbereen Rowing Club is always on the lookout for new members. If you are interested in rowing, coaching or becoming a coxwain, we want to hear from you! Rowing is a very safe and enjoyable sport. Rowing, both on and off the water is a great way to develop your fitness, or stay physically active. Regular exercise, fun and friendship all contribute to your health and well-being. Rowing is an up and coming sport in Ireland with many Irish athletes now achieving success at International level. Rowing teaches less obvious things, like working as part of a team, self discipline, goal setting and staying controlled under pressure. You will be pleasantly surprised at the range of skills you will acquire and develop through rowing. Come along to Skibbereen rowing club to try rowing on Sunday mornings at 10.00am. When you decide you want to continue rowing, you can then fill in the club application form and arrange to pay membership. If you are a seasoned rower, we have competetive men's and women's squads who compete at national and international events throughout the year. Skibbereen Rowing Club also runs a programme for senior classes in local primary schools. Around 10 national schools usually participate in this programme which lasts for 6 weeks. Each class visits the club for one hour every week. During this time, they are taught how to row on a rowing machine as well as on the water. They learn about the different types of boats and names of different equipment. They make great progress every week, rowing in an oct, a quadscull or a double scull. 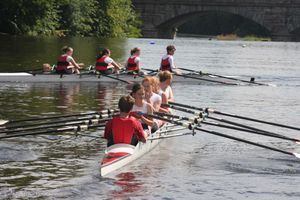 They then receive a certificate at the end of the 6 weeks and their membership lasts throughout the Summer months for those who would like to continue to develop their rowing skills.